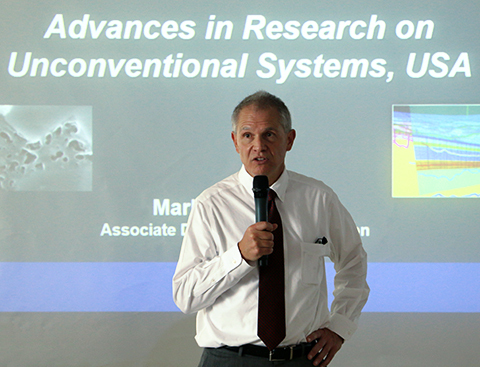 As part of the Joint Laboratory Agreement between the Bureau and China University of Petroleum (CUP) at Qingdao, a Bureau contingent traveled to China in July for discussions with key Chinese research collaborators and industry sponsors. Bureau Associate Director Mark Shuster and researchers Hongliu Zeng and Tongwei Zhang met with CUP President Fang Hao, Vice-President Yao, and other senior CUP administrators, as well as Dean of Geosciences Lin, faculty, and students to discuss the next steps for research collaboration and lectures on the latest advances in unconventional research, organic geochemistry, and seismic sedimentology at CUP’s School of Geosciences. President Hao praised the discussions between the two groups and vowed to do his best to make the funding of joint research projects a reality. The Bureau group was also given a tour of one of the world’s most prolific dinosaur fossil sites near Qingdao, which included a 500-m-long walk through excavated outcrops littered with Cretaceous-aged dinosaur fossils. In Beijing, the Bureau group met separately with its longtime industry sponsor, RIPED—the research arm of the China National Petroleum Corporation (CNPC)—and with Sinopec, both strong supporters of the Bureau. Shuster lectured on advances in unconventional shale developments and tight-gas sandstones, and Bureau representatives discussed proposed projects with both companies. On the occasion of RIPED’s 60th anniversary, Bureau delegates presented RIPED with a commemorative banner. The Bureau and Sinopec are in the initial stages of a joint proposal for the characterization of the Triassic tight-gas sandstone reservoir and sweet target prediction in the Sichuan Basin. At a final visit, Zhang and Shuster lectured at the China Oil and Gas Survey and discussed the Bureau’s ongoing collaboration with the Survey. The Survey’s Dr. Cong Zhang will begin an extended visit at the Bureau to work with Tongwei Zhang and others on geochemical research of gas-bearing shales in China. 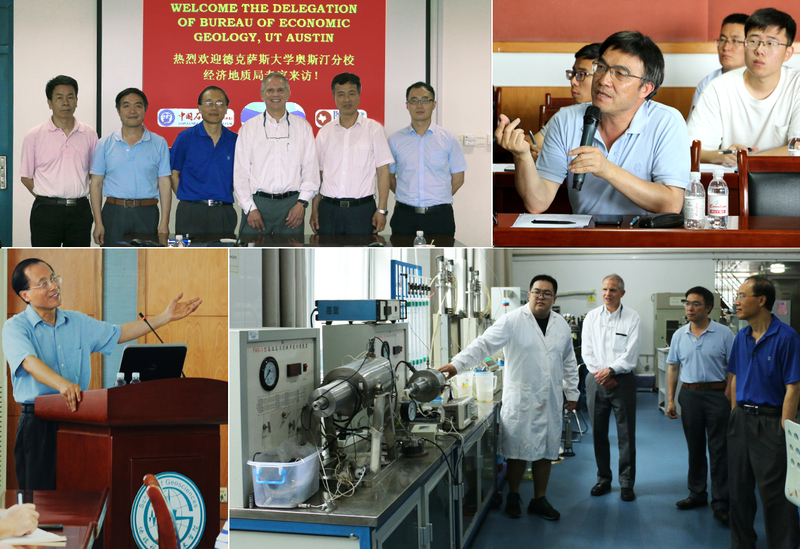 Clockwise from top left: The Bureau delegation is welcomed by their hosts from CUP; Tongwei Zhang discusses key considerations of the cooperative agreement; Hongliu Zeng presents Bureau research efforts; the group receives a tour of one of the research laboratories.